Upon your arrival at Bangkok Airport, meet our representative who'll assist you in smooth transfer to the Pattaya hotel for hotel check-in. Located 150 kilometers South-East of Bangkok, Pattaya is less than 2 hours via road. A beach resort with city status, Pattaya offers something to everyone. Although a beach resort, Pattaya makes an all-out attempt to provide the best of everything- sightseeing, recreation, fun and entertainment. Stay overnight in Pattaya. The morning is scheduled for Coral Island Tour. Start the day with a healthy breakfast. You will be picked up from the hotel and dropped to the designated point where speed boat will take you to Koh Lann Island. Also known as Coral Island, Koh Lann is a lovely spot. Catering to all kinds of tourists, it is the perfect spot for fun. Laze around on the island's soft, white sand, or get active with few watersports. The adventures of parasailing, water-skiing and jetskis are on offer. The nearby islands of Koh Krok and Koh Sak, is blessed with an abundance of coral and undersea life. Discover the uncharted horizons with snorkeling and deep-sea diving. Note that, there are no dive shops in this area so you need to carry you own equipment. **Please note this tour is not included parasailing and undersea walk if they want they can purchase as an optional. After you are done for the day, a speed boat will bring you back from the island. After the fun-filled activities treat yourself to lunch at Indian Restaurant in Pattaya. Enjoy a restful overnight stay in Pattaya. Post breakfast in the morning; meet our tour representative who assists you in smooth transfer to the hotel in Bangkok for check-in. Post check-in, you'll proceed for the temple and the city tour. The rest of the evening is free for you to explore the city on your own. Stay overnight in Bangkok. 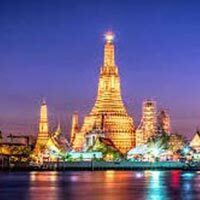 Bangkok offers an exciting mishmash of cosmopolitan amenities and cultural treasures. It takes great pride in a large number of fascinating temples around the capital. 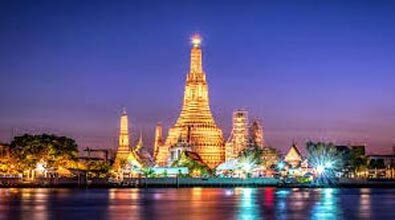 The major attractions include Golden Buddha Temple- Wat Trimits, Buddha Temple- Wat Pro and the Thai Traditional Massage School. Post breakfast in the morning, it is your day to explore the length and breadth of the city. You can even choose to go to the nearby market to purchase souvenirs from the market. Stay overnight in Bangkok. Post breakfast in the morning, you will be transferred to the airport for onwards journey back home.